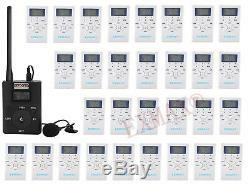 EXMAX 60-108MHz Portable DSP Stereo Wireless Headsets FM Radio Broadcast System for Tour Guide Teaching Meeting Training Travel Field Interpretation. 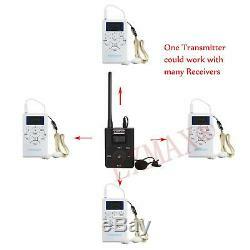 1 Transmitter and 30 Receivers White. Color: 1 Transmitter 30 Receivers. Features: FM frequency range 60-108MHz(0.1MHz spacing between channels) One transmitter can work with multiple receivers within the operating range Individual volume control on each receiver Both transmitter and receiver use LCD-display to indicate frequency, channel, battery, level status Specifications Transmitter: Model: EX831TransmitterBlack Frequency range: 60-108MHz (adjustable) Frequency increase: 0.1MHz Frequency stability: ±10PPM Frequency response: 50Hz-1500Hz Signal to noise radio: <60dB Transmission power: 0.01/10/100/200mW Reference distance: 50/60/70/80M Working hours: 8/6/5/3h Power: BL-5C 3.7V 1000mAh Charging time: about 5 hours Support TF Card: only support MP3 format Size: 80x58x18mm/3.1x2.3x0.7in Receiver: Model: EX102ReceiverWhite Frequency Range: 60-108MHz Sensitivity: <3.5uV Signal to noise ratio: 45db Stereo separation: 32dB Power supply: 2 x AAA batteries(not included) Earphone jack: 3.5mm Tuning increase: 0.1MHz Built-in speaker: No Material: ABS Plastic Size: 92x53x13mm/3.6x2.1x0.5in Suitbale For Guided Tours Factories, Museums, Tourist Attractions, Zoos & Theme Parks, Cruise Ships & Buses, Schools, Meetings & Lectures, Employee & Dealers Training, Hotels and Resorts, Special Events. Educational Institutions, Corporate Meetings, Training and Seminars, Theaters, Governmental Agencies, Houses of Worship, Conventions and Auditoriums. 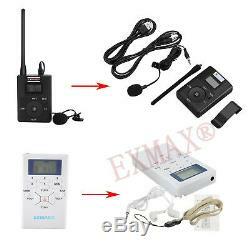 Package Contents 1x EX831 FM Transmitter Black(Battery Included) 30x EX102 FM radio Receiver White (Battery NOT Included) 1x Antenna 1x USB charging cable 1x Microphone 1x Belt clip 1x Audio Cable (1.2 meter) 1x BL-5C lithium battery 30x In-ear Stereo Earphone 30x Lanyard 30x English User Manual. 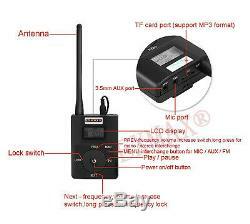 Professional Wireless FM Radio Broadcast Tour Guide System. 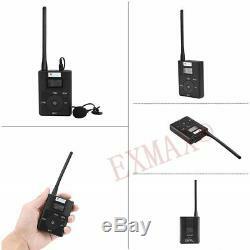 Real digital signal transmission with very stable and clear audio quality. Designed with Stereo and Mono audio output, both AUX line-in and Microphone volume is adjustable. Special Antenna: The noise is <60dB, achieving professional standard. 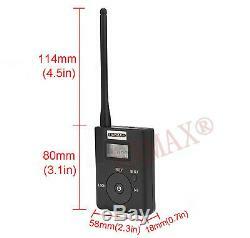 Transmit frequency is adjustable from 60-108MHz;You can transmit across the whole public FM band. Portable size with Large Digital LCDS creen Display and easy to be carried. 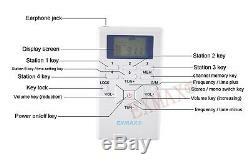 LCD display for transmitter and receiver, channel, volume, very easy to operate. With Earphone for better listening environment;Lock switch to prevent accidental operation;Lanyard can suspends gently around the neck for comfort, slim design and nice looking, Light weight and small size. Expandable & DIY:One transmitter can pair up to Countless receivers. If you have more than one Tour guide or Simultaneous interpreting area you would like to add, just DIY and fulfill your needs. (1)Maximum transmission distance is about 80 meters(on open area, no obstacles). (2)Powered by BL-5C 3.7V 1000mAh Li-on battery, 4 levels of power output: 0.01mW, 10mW, 100mW, 200mW. (3)3 kinds Broadcasting Modes:(a). (b)Mic input: With a lapel microphone, Broadcasting your voice to make speech, teaching, training, traveling, etc. (c)Support TF card(MP3 format): Only support MP3 files. This portable radio adopts digital signal processing technology, using the software programming achieving of wireless radio. (2)5 Station Presets: Manually store five favorite stations, press 1-5 key to quickly select storage station. (3)Mono/stereo select-able, with 24 hour digital clock. Powered by 2 AAA battery(Not Included). 30 level volume control, Lock switch to prevent accidental operation. (4)Comes with an ear-in headphone. The item "EXMAX 1 FM Transmitter 30 FM Radio Receiver Wireless Tour Guide System 60-108MHz" is in sale since Wednesday, December 19, 2018. 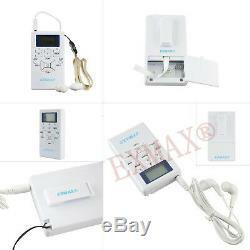 This item is in the category "Consumer Electronics\Portable Audio & Headphones\Portable AM/FM Radios". The seller is "yespainting" and is located in Hong Kong. This item can be shipped to North, South, or Latin America, all countries in Europe, all countries in continental Asia, Australia.